The growing season in my neck of the woods is winding down, and any day a hard killing frost could bring it to a screeching halt. I’ve started stashing some vegetables for winter keeping. Three bushels of potatoes in the well pit, a bushel of red onions and several butternut squash in a cool dry corner of my basement. Also stored in the basement are sweet potatoes kept in flat wooden crates lined with newspaper. I don’t grow my own potatoes and onions. These particular crops don’t grow well in my heavy clay soil, so I get them from Kindy’s, an organic farmer a couple of miles down the road from my house. It’s nuts that the soil is sandy just 2 miles from my place. Why couldn’t I be so lucky? The guys in my household seem to think deep orange veggies should always be served with lots of butter and sugar. I”m constantly trying to find new ways to fix sweet potatoes and squash that don’t involve so much butter and sugar, but somehow it always comes back to the same old thing. My sweet potato waffle recipe is no exception, but at least the sugar is in the form of maple syrup my husband makes each spring. I would like to take this opportunity to shamelessly plug my hubby’s maple syrup. He still has one half gallon and some quarts left to sell, and would really like to get it off his hands before we head into winter. Seriously, you NEED some real maple syrup for your Sunday morning waffles, so head over to Bart’s Maple Syrup and buy some now! And now back to your regularly scheduled programming. 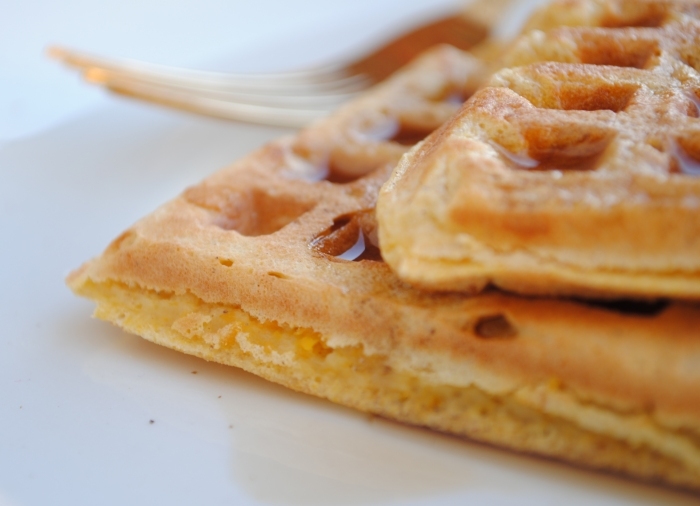 Because of the inclusion of mashed sweet potato, these waffles have a more dense texture than a typical light, airy waffle. Also, I’ve never been able to get them crispy, but it may be due to the fact my waffle iron about 20 years old and needs to be replaced. I did a little bit of research, and discovered Belgian waffle irons are supposed to do a better job of producing crisp waffles than traditional style waffle irons. After reading both professional and consumer reviews, the Presto 3510 FlipSide Belgian Waffle Maker looks like it would be my best bet for a reasonable price. 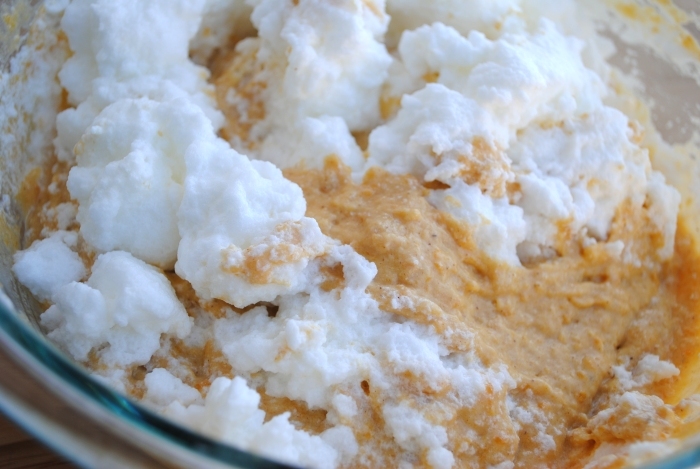 Beat sweet potato, milk, and egg yolks together. 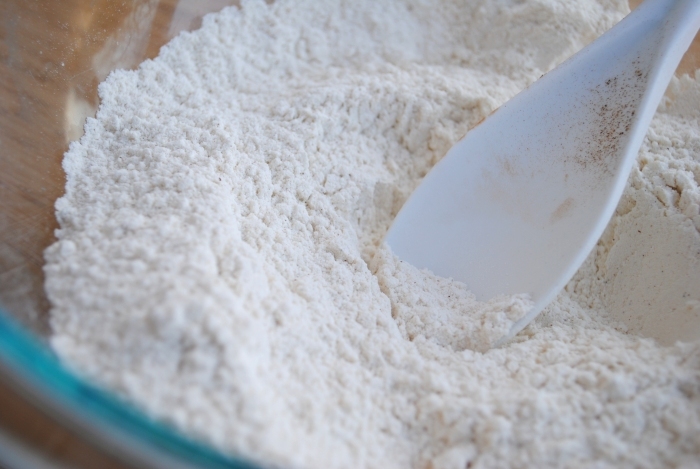 In another bowl, combine flour, sugar, baking powder, spices, and salt. 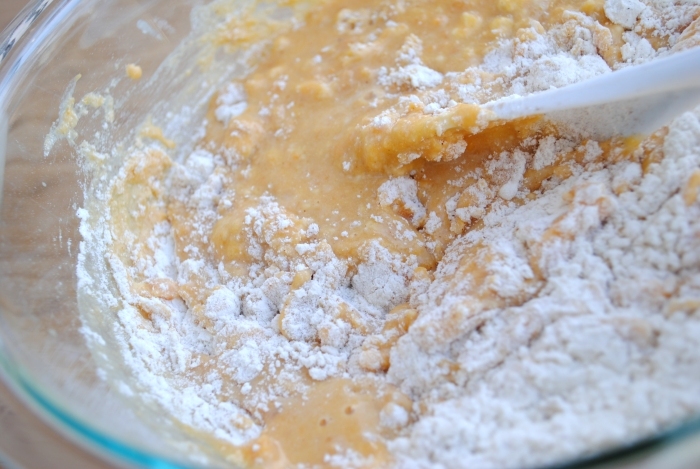 Next, mix the sweet potato mixture into the flour mixture. In yet another bowl (sorry, this is a 3 bowl recipe, but they clean up easily), beat egg whites until stiff. Gently fold egg whites into sweet potato batter. Proceed to prepare waffles according to the manufacturer’s directions for your waffle iron. I had a request from a friend for sweet potato pancakes because she did not own a waffle iron. Here are a few tips for converting this recipe for pancakes. First, don’t bother separating your eggs, and mix them whole with the sweet potatoes and milk. 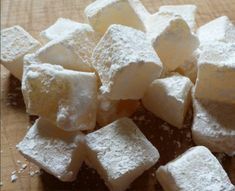 Secondly, you may want to consider reducing the sweet potato by 1/4 to 1/2 cup, and/or increasing the milk by 1/4 cup. 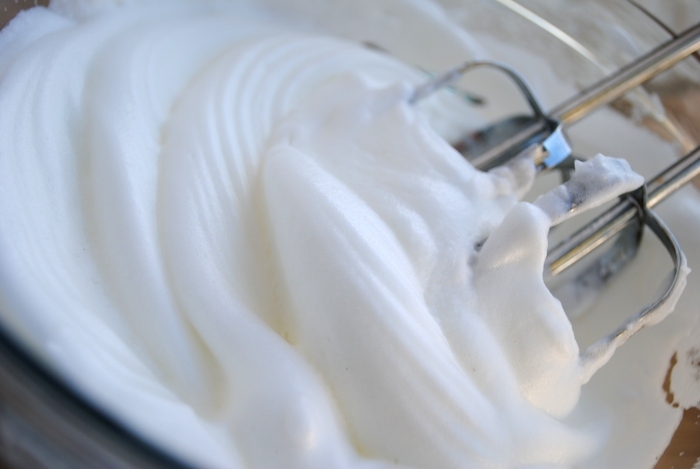 You may need to tinker with it depending on how thick or thin you like your pancake batter. 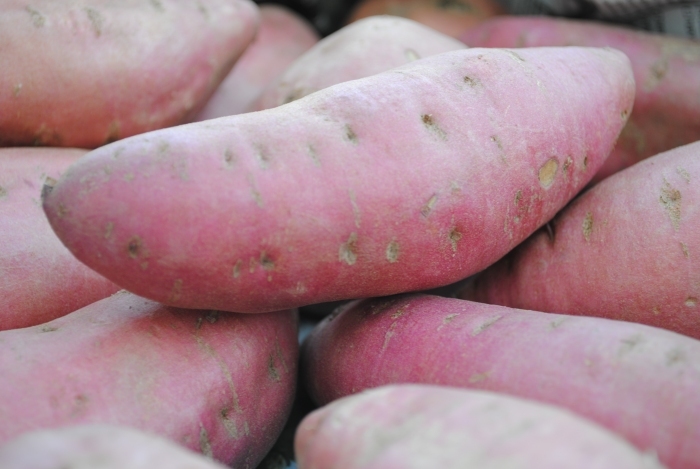 Sweet potatoes produce a dense textured pancake, so if you want a lighter textured cake you will need to reduce the potato. 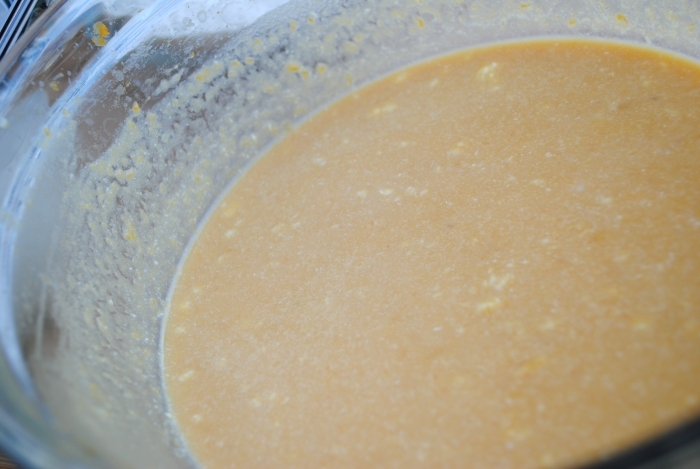 Lastly, for pancakes you can reduce the butter and sugar by half. 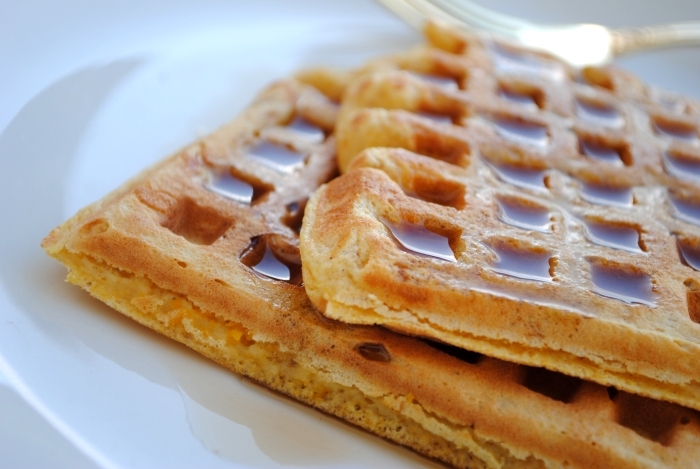 Waffles use a little more butter and sugar to develop crispness.